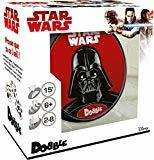 Dobble is a cute little game in a tin, which is very easy to carry around and has very simple rules. We first came across Dobble on a visit to Coffee and Dice, one of our favourite gaming cafes in Bournemouth, and a great way to pass a rainy day on one of our holidays in Mudeford. You pay to use a table and you can play as many games as you like from a vast selection, so we chose a game each in turn and one of them was Dobble. The premise is very simple – there are 55 cards, each one has 8 symbols on it out of a total of 50 symbols. 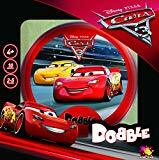 if you take any two cards at random, they will always have exactly one symbol in common, so the games that you can play with the Dobble pack consist of identifying the common symbol between two cards and being the fastest person to do so. if you are interested in the mathematics behind why it’s 55 cards, 8 symbols and how you can guarantee that there is only one common symbol on each pair, then there is a leaflet in the tin which tries to explain it But for most of us, the best thing is to just get on and play. The booklet suggests 5 different mini-games but you can make up your own as well, as long as you all agree on the rules before you start. 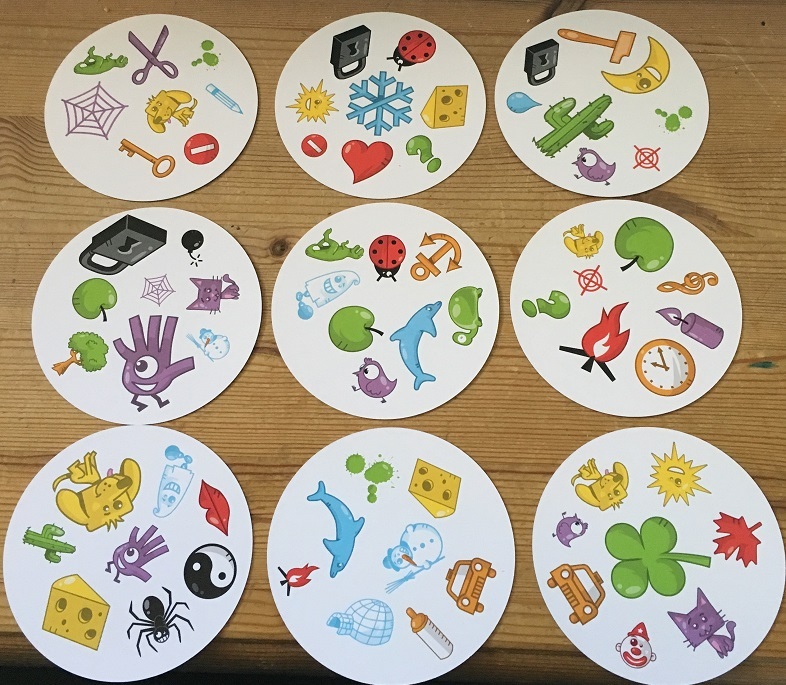 We found after our first game that it was also useful to look at all of the symbols and decide what we were going to call them because there were one or two in the first game where the children had spotted the symbol but didn’t know what it was. You can, of course, play with these cards as a solo game, maybe matching ech card to the one which comes before it and timing yourself to get through the whole pack. Where I have put 2 words those were alternative words that my family used to describe the same thing. Here is another one. I’m not putting the answers up this time. Find the common feature between each card and its neighbou, horizontally, vertically and diagonally – there are 20 to find altogether. Are you hooked yet? I could stare at these for ages. I haven’t included any photos of our family playing the competitive games because, as I said my children outclassed me in every way – it was totally embarrassing. I’m proud of them but also sad that I am no longer as observant or fast as I thought I was. But there it is – a good game and one that my children enjoy playing together and on their own. 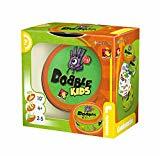 You can by Dobble on Amazon (affiliate link) and I think it would make a fantastic stocking filler, especially if you have kids that get up at the crack of dawn on Christmas day and need something to entertain themselves before the adults get up. Dobble also comes in special editions – click on the images to see more information. What’s your Black Friday shopping strategy?